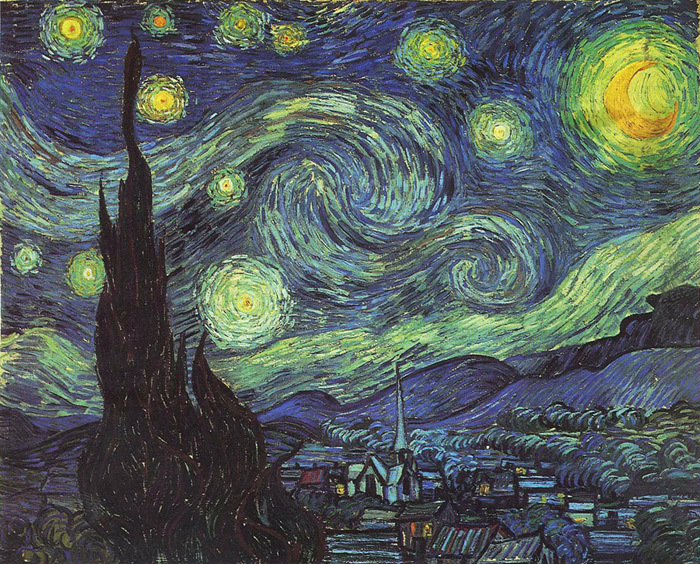 "Starry Night" was completed near the mental asylum of Saint-Remy, 13 months before Van Gogh's death at the age of 37. Vincent's mental instability is legend. He attempted to take Paul Gauguin's life and later committed himself to several asylums in hopes of an unrealized cure. Van Gogh painted furiously and " Starry Night" vibrates with rockets of burning yellow while planets gyrate like cartwheels. The hills quake and heave, yet the cosmic gold fireworks that swirl against the blue sky are somehow restful. This painting is probably the most popular of Van Gogh paintings. SPECIAL NOTE : The painter will make the reproduction as close to the original oil painting as possible. If you want your painting to alter from this likeness, please email us and " Starry Night, 1889 " will be reproduced according to your special requirements.